Our picks for our favorite books, movies, comics, video games and more! Have you ever been so surprised and delighted by something you’ve read or watched that you just have to share it with everyone you know? 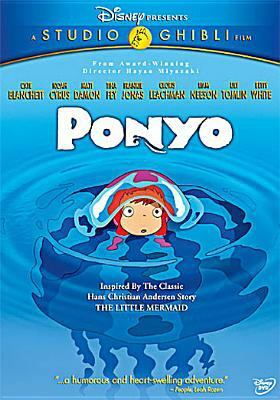 Well, I just have to share Ponyo, a Japanese animated film that was released in the United States in 2009. The movie was written and directed by the award winning filmmaker Hayao Miyazaki. Although I’ve seen several Miyazaki films, I think Ponyo is my favorite. The movie is a fairy tale inspired by Hans Christian Andersen’s “The Little Mermaid”. In this iteration of the famous story a young fish (not a mermaid), befriends a boy, Souske, and decides that she wants to become human. Ponyo transforms into a magical little girl (no voice-stealing sea witch necessary) and enthusiastically learns about being human while living with Souske and his mother, Lisa. Lisa isn’t fazed when her son’s pet fish becomes a child (“Ponyo came back and she’s a little girl now!”, Souske says matter-of-factly.) Meanwhile, Ponyo’s father, a former-human undersea wizard, is worried about the imbalance in nature that Ponyo’s transformation has created. He believes that all will be okay if she returns home. He discovers, however, that Ponyo and Souske’s friendship and love can be enough to correct the problem. Although the plot is familiar, I was completely invested in it from the start. The animation is fun, the American voice actors (including Tina Fey, Cloris Leachman, and Matt Damon) are clearly having a good time with the material, and the story is funny, emotional, magical and surreal. Ponyo can be borrowed from the library. Are there any movies, books or TV series that have surprised you? Please share your recommendations in the comments. The Hoboken Public Library is on Instagram! Follow the Hoboken Public Library on Twitter!